This past weekend, April 4-6th, something historic took place in Memphis, Tennessee. During the same few days where people from across the nation gathered in the place where Martin Luther King Jr’s was assassinated forty years ago to honor the man, his legacy, and his dream for America, a thousand people, the majority of them people of color, came together to take part in rebirthing MLK’s vision. At The Dream Reborn, visionaries, artists and leaders came together to “create ecological solutions to heal the earth while bringing jobs, justice, wealth and health to all our communities.” We saw environmentalism re-defined, re-vitalized, re-energized and re-imagined, and witnessed not just the rebirth of MLK’s dream, but also the birth of a transformative movement with the power to bring the kind of change that we so desperately need. The Dream Reborn was a weekend charting a new environmentalism that isn’t so new: the marriage of movements for social justice and the environment. Environmental Justice and other groups have been working at this intersection for years. Racial and Economic justice organizations strive to put an ecological lens on their organizing, just as Environmental organizations strive to put a racial and social justice lens on their work. But this weekend was the birth of that organizing with new language that is gaining influence in the mainstream of society, energy around program such as Green Jobs, and forcing major institutions and even presidential candidates to take notice. In more ways than one, the time for a new environmental movement, one for justice for both people and the planet, has come. 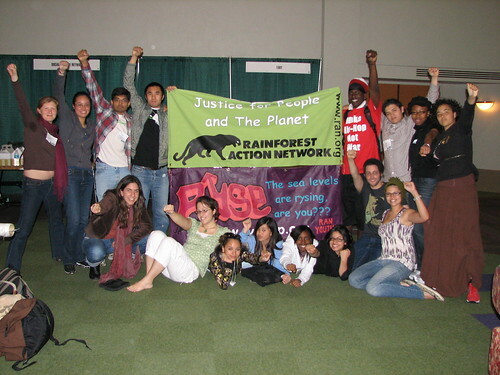 We spent our time at Dream Reborn coordinating and participating in Rainforest Action Network (RAN) – and it’s youth arm RAN Youth Sustaining the Earth (RYSE)’s youth delegation. 13 amazing people aged 13-22, along with 4 RAN staff, came together from across the nation. We represented many different communities, ages, and interests. We came to Memphis to connect, learn, grow, share and ultimately leave with the tools and the inspiration to go back to our communities and build a just, sustainable future. It was a chance not only to bring diverse youth to the table as stakeholders in conversations around green jobs and movements for environmental social justice, but to offer ideas and leadership to RAN’s growing network and the evolution of RYSE. Featuring keynote speakers such as the Reverend Lennox Yearwood, Winona LaDuke, Afeni Shakur and Majora Carter, with Van Jones emceeing the event, it isn’t surprising that visions of a future of eco-equity permeated the entire weekend. Workshop and panel sessions such as Food Justice and Building a Youth Movement for Green Jobs focused on providing conference attendees with the connections and skills needed to go back to their communities and make this vision a reality. A shared understanding of the truly historic moment we were all partaking in created a space that was imbued with hope and spirituality. There were many moments when we all broke out in spontaneous hand clapping, song, celebrating the beginning of a revolution birthed from love, compassion and respect for all people and the planet. The conference was more than just a networking opportunity. We were building community. Community with one another as RAN and RYSE organizers; community across organizations and movements. It was the birth of something exciting. It charted a course for a new revitalized vision for our country and the world. It helped provide the kind of glue that social movements are made of, bringing together the longstanding amazing work of organizers and organizations for racial and economic justice, and for the sustainability of our planet, in a way that makes a truly multi-racial mass movement for change in this country seem within our reach. As young people, we’re committed to making the dream a reality. Lucky for us, we have the knowledge and wisdom of movements past and present to build with and learn from. We’re ready. A great Bay Area benefit show to benefit the March To Tibet Campaign. Folks are trying our best to raise as much money for this historic uprising movement of Tibetans to successfully sustain in the most critical of their times… we will also be mobilizing ALL our attendees to come out to the streets on April 9th to protest the passing of the Olympic torch through SF. It is the most strategic chance to raise the profile of the struggle for the right of return to a free Tibet in a long long time. Click below for all the info on the show!